The history of Grapeland begins not in 1872, but also in the communities of north Houston County that had sprung up near established trails of the animals and Indians which recede them. Many of the earlier communities exist only in the memories of our older citizens. Some are still in existence today. However, we attribute much of Grapeland’s early rapid growth to the influx of businesses and people from surrounding communities. Just as the lure of free land in the west caused the westward movement to Texas, the railroad and easy transportation caused men of enterprise to move to the railroad-selected town site of Grapeland. It is our desire in this history to preserve the knowledge of and spirit of those who have traveled these paths before us. We salute the men and women who faced the challenge of bringing civilization to the wilderness, knowing that Their efforts would have to benefit those of the future for they could not possibly achieve the measure of advancement they envisioned in a single lifetime. We can but hope that by reading of the great courage and effort our ancestors show in their lives that we can inspire our young to look inward and find that inherited pioneer spark to continue to develop and live a proud, free life. These people about whom we write did not have material wealth, but were wealthy beyond belief in their mutual benefit of each other. If we sacrifice this heritage for material wealth, it will be as the scripture says “For what shall it profit a man if he shall gain the whole world and losehis own soul.” Let us hope that by reviewing the past, we can enrich the future. Many things happened in this area before Grapeland wasestablished in 1872 that had a great deal of influence upon it. Indians, Spaniards, and French explorers passed this way before our forefathers even knew of the existence of this land. We know that the early settlers who came here came mostly in groups for their own protection against the forces of nature, the wild animals, and the unfriendly Indians along the way. Many of the early settlers of this area came here in the early 1830’s. Some men came on horseback alone to first make a place for their families before subjecting them to this wild life. Dangers often lurked along the trail and some were killed by Indians or by other means and never returned to tell the story. One man (Brad Davis) left Mississippi and came with his elder son and was killed by Indians near Austonio. Means of communications were very poor in those days and his family back in Mississippi did not know he was dead. Many years later his grandchildren returned to the old home to find that the kin had felt greatly ‘put upon’ all those years because they had had to raise the rest of his children that he had left behind. One rather large group that came in covered wagons tells of their fear in 1833 while camped in Arkansas when a great meteor shower occurred. The early settlers built their homes at easy river crossings and along the old established paths. The land was acquired in many ways. Many received land grants from Mexico. Others received land as awards from the State for various services rendered. Some acquired their land by squatter’s rights, while others bought their land from those who had come before them. The pioneers came down old established trails which probably had their beginnings from the animals as they moved through the woods to watering places. Indians also used those same trails. Some roads were made by men walking ahead of groups finding an easy path and blowing a horn to signal for the wood cutters to come that way. During the early days, Galveston, Texas was the chief port for shipping and receiving supplies. The Trinity and Neches rivers both had ferries and good fords for crossing. Steamboats were also used on the rivers to carry passengers and goods. The 1893 Courier reported on the progress of a steamboat named Harvey as it made its way up the Trinity past Alabama Crossing on the way to Dallas. The Harvey was having to proceed cautiously because of overhanging trees and shrubs and was making only 8 miles an hour. The river was reported to be in good condition for boats and there were three boats in service. According to old census records, most of the people who came to North Houston County were natives of the states of Georgia, Alabama,Virginia, Mississippi, and Tennessee. In 1895, the Crockett paper reported that a colony from Arkansas had settled between Augusta and Grapeland making the road almost a solid lane of residences. It also reported that fully a thousand people had settled in the northern part of the county in the past year. The square miletownship of Grapeland showed an increase in population from 300 in 1890 to 600 in 1894! Most of the early day settlers were farmers and farmed as they had in their native states. The main crop was cotton and according to records of that time, the fertile land along the Neches and Trinity Rivers yielded one bale to the acre. The cotton was carried to the closest cotton gin and then overland by ox-wagon to the nearest river. John McMullen Selkirk was one of the early settlers who ran a freight company that carried goods as far as Nacogdoches in ox-wagons. One of the earliest gins in the Grapeland area was located at what is now sometimes called Convict Springs. It was so-called because convict labor was used to build the railroad bridge at this point. This gin was southwest of Grapeland toward Latexo and was powered by water from the springs. There was also a grist mill there to grind grain. Other gins of this early day were powered by horses and the cotton was compressed in a hole by men stepping on it to press it down. The early day farmer found the farming possibilities here almost limitless. With a growing season of 248 days and an abundant rainfall, they found they could raise almost anything they needed. Crops that were produced in abundance were cotton, corn, potatoes, syrup cane, tomatoes, peas, beans, berries and many fruits. Two items that was very difficult to obtain except in the large trading centers such as Palestine and Nacogdoches were coffee and tobacco. Experimenting with tobacco they found that it too grew well in Grapeland and expected it to be a future possibility as a money crop. The lone Indians (Tejas Tribe) were of some threat to these settlers as late as 1850 and several of the early families were almost wiped out by these Indians. Some of the earliest settlements to develop in North Houston County were Augusta, Antrim, Reynard (then called Trinity Chapel) and Dalys. The Grapeland area was probably located too far from the river crossings to develop as a community. All that existed here in those early days was the crossing of two roads, the road from Augusta to the Trinity River and the road from Palestine to Crockett. Thus it came to be called the crossroads. The stagecoach passed this way and the mail was carried by horseback. Antrim was one of the earliest mail drops for this area. According to several of our older citizens, before Grapeland was a town, Randolph Yarborough lived near the crossroads and his home was a convenient location to pick up their mail. The settlers asked to have their mail left there, but an address was needed. Miss Kitty Yarborough is said to have suggested that they just call it ‘Grapevine’. On June 8th 1837, Houston County was created from a part of Nacogdoches County and the county seat of Crockett was incorporated on December 29 of that same year. The county grew as more and more people settled here. Included in the following pages are accounts of the early communities of the North Houston County area. The town site of Grapeland places its beginning at the time of the coming of the railroad. 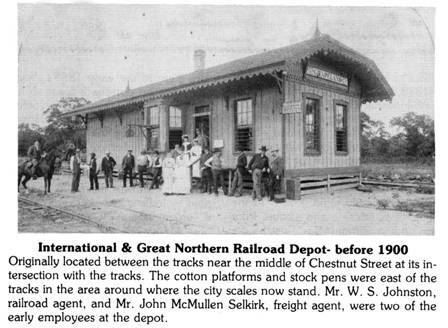 In 1871, the Houston and Great Northern Railroad Company drew up plans to build the railroad through this country. 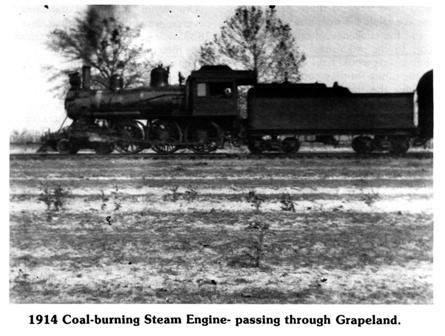 During 1872, the railroad was built through Grapeland and into Palestine. They selected the John Erwin Survey as adivision point and for the development of a town. After acquiring this 640 acre tract of land they turned it over to the New York & Texas Land Co, to sell and develop. The land company drew up the town plan and donated the streets to the town. The business section of the town was divided into lots measuring 27′ x 125′ and 90′ x 125′. The corner business lots sold for $100 and the inside lots for $75. The original intent of this company was that Oak Street would be the main street and because of this it measures 100′ in width and the others were 80′ wide. Even though the name of Grapevine had been suggested, according to Houston County deed records, the Houston and Great Northern called the town site Grapeland in the dedication deed of 1873. The town was so named because of the many vines that had to be cut as the railroad laid its track through this country. The first train passed through Grapeland in 1872. It was a wood-burning, huffing, and puffing steam engine with an appealing sound to its steam whistle. One of our present day citizen’s recalls that his grandfather Turner Skidmore went to Palestine the day before the train came through so that he could ride it back home. All the neighbors and friends went down to the depot for this great event. This very young citizen jumped out of bed when he heard the whistle and ran out in his nightshirt to see his grandfather come in on the train. 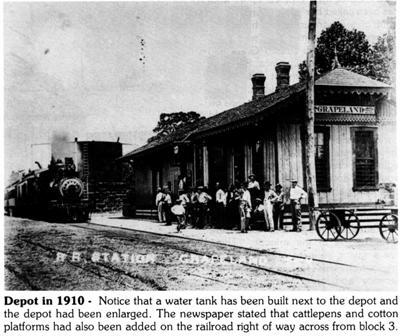 The railroad built a depot, cotton platforms, seed houses and a water tank along its right of way and very soon after this the settlers began to buy land out of the area set aside by the New York and Texas Land Company for the town. In the early deed records we find many familiar names of families who still have children and grandchildren in this area. The earliest lot bought was lot no. 1 in block 3 by T.T. Beazley and J.H. Wooters in November, 1872. 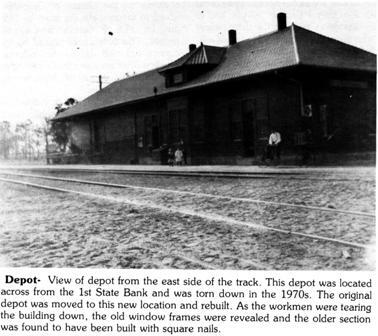 This lot was directly across the street from the depot, which was located at that time between the tracks about the middle of the present day Chestnut Street crossing. Other town lots purchased in 1873 were made by C.J. Pennick & J.M. Selkirk, W.H. Campbell, S.J. Lewis, Dan Egbert, T.H. Dailey, B.F. Edens, J.B. Cunningham, T.J. Cook, W. McLean and R.M. Garrett. These early sales were all made in blocks 2 and 3. According to an article written by Judge John A. Davis, who was justice of the peace from 1888 until 1929, Tom and Jim Beazley had the first general store in Grapeland and across the street from Beazley’s store, R.M. Garrett ‘conducted’ a hotel. Next door to the hotel, T.S. Cook opened the first saloon. Frank Edens went into the general store business at about the same time that the saloon opened. Most of the general stores in the early days sold `hard liquor’ and had an area in the store set aside for games. With the coming of the railroad Grapeland began a period of rapid growth. People from the surrounding communities gradually moved to the new town and as a result it began to grow at the expense of those other communities. Grapeland then entered upon what has been called her ‘tough period’. The spirit of independence which brought pioneers to this country and the whiskey which flowed freely caused Grapeland to be a wild and woolly place. Shooting scrapes were very frequent. Often innocent men were shot accidentally. No woman dared to go upon the streets on Saturdays. Some startling tales are told of men riding their horses into the stores. There are stories of gambling, shooting, and general toughness. At night the crew on the freight trains would lie down on the floor to keep from being shot while passing through Grapeland. These ‘tough’ characters, although they did some awful things and attracted much attention, were never-the-less in the minority. There was a saving element of good citizenship which was forever fighting for decency and order. Grapeland was reputed to have had as many as four saloons at one time, but gradually one by one they were closed under the pressure of public opinion. To the best of our knowledge there were no open saloons after 1902. Whiskey could still be easily obtained through a local merchant by special order for off premises consumption or by direct shipment on the train. One of our older citizens stated that it was not necessary to order whiskey from Palestine. All you had to do was go in and ask the depot agent “Has my order come in.” He would ask, “What kind did you order?” You could then state your preference and a bill of lading would be written and your order would be found in the storeroom. In 1886, the main residential area was in blocks 5, 6, 7, and 12. W.W. Lively owned a hotel where the J.W. Howard (now Horace Jones) home now stands. Mr. Lively also owned the first buggy in Grapeland. It was used to carry travelers from Grapeland to Augusta. The oldest house in Grapeland is the home of Mrs. Ann Lois Lyles (521 Chestnut) and was originally the home of T.T. Beazley. In the interest of the betterment of the community, the citizens of Grapeland voted to incorporate the town in 1899 and Dr. H.S. Robertson was elected mayor. The ordinances passed by this council reflected the needed reforms. The first ordinance required cleaning up and disposing of rubbish from around the business houses. The second ordinance prohibited the railroad from obstructing public crossings for more than five minutes. Next, people were prohibited from unlawfully getting on or off moving trains. The council also ordained that all males between twenty-one and forty-five were required to pay the city three dollars annually or work on the roads five days. The fifth ordinance gave the Mayor the powers of the Justice of the Peace to enforce the ordinances. The 6th ordinance made it unlawful for any person to create or permit a nuisance. The last ordinance signed by Dr. H.S. Robertson as mayor and S.E. Howard as secretary, made it unlawful for any person to unnecessarily discharge firearms of any kind within the city limits. J.J. Brooks was a member of this first council, but there is no record of the other members. The next mayor was Dr. F.C. Woodard. Some of his ordinances were: prohibiting ball games or other noisy games outside of private enclosures on Sunday; prohibiting abuse of livestock and birds or other harmless animals; prohibiting the shooting of a gun, toy gun, air gun, sling-shot or any other shooting or slinging thing; required the removal of fences from public roads; required the underpinning of homes so that hogs could not root under them; and prohibited the shooting of cannon crackers, roman candles or torpedoes. The corporation of Grapeland fell into disfavor with the citizens and in 1907, an election was held to abolish the corporation and the vote carried 40 to 9. The newspaper headline read, ‘The Incorporation Abolished Vote 40 to 9 Cocka- Doodle Do.’ Failure of the people to pay their taxes and the inability of the council to enforce the ordinances caused even the editor of the paper to favor disincorporation. One of the arguments in favor of abandoning the incorporation of the city was that without that tax load the citizens of Grapeland could concentrate on building a new brick school. The school in Grapeland had begun somewhere along the way, but the exact date is unknown. It was first in an old log house at the site of theBaptist Church, then in a frame building on College Street. Through these early years, the business sections had experienced a steady growth. In 1901 Grapeland was called ‘The Queen City of The Sand Flats’. It boasted of having five general stores (Faris & Spence, Geo. E. Darsey, Sam’l T. Antony, Jas. Owens & Co., and J.E. Hollingsworth); one staple and fancy grocery (M. L. Clewis); a drug store (Boykin & Murchison); a fully equipped and modern blacksmith shop (Burt Guice); woodworker’s shop and manufactory of farming utensil (Blount & Guice); lumber mill (Hollingsworth & Davis); a broom factory (Dunnam Broom Factory); three sawmills (J.J. Brooks, J.N. Tyer, and B.C. Williams); two cotton gins (Bill Lively), and a hotel (Totty’s Hotel); livery stable (Poke Taylor); photograph gallery (Ike Whitaker); and post office (B.F. Hill, postmaster). The three practicing physicians who looked after the occasional cases of ‘chills and fevers’ were Dr. Lewis Merriwether, Dr. F.C. Woodard and Dr. H.S. Robertson. A familiar sound of this early day was the blowing of the whistle of the cotton gin. 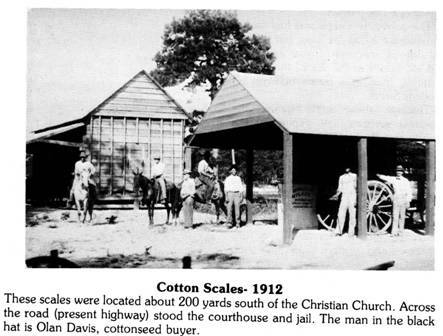 In the fall wagon loads of cotton were lined up for several blocks waiting to be ginned. Mr. Bill Lively had the first gin in Grapeland, located on what is now the Horace Jones property, shortly followed by J.J. Brooks in the block across from the Methodist Church. Mr. Mose Spence later built a gin across from the Baptist Church. Mr. Spence sold his gin to M.P. Herod and Fred Bridges. A.B. 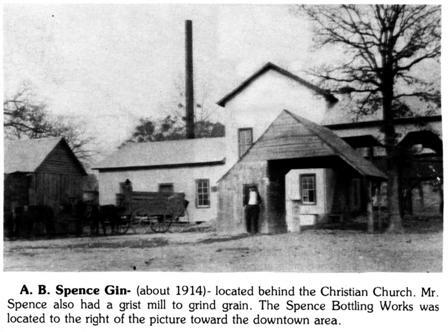 Spence went into the ginning business in 1908 behind the Christian Church. One would wonder if there was some relationship between churches and gins! Perhaps the owners felt the need for protection from the citizens when the mighty blast from the whistle woke them from their five o’clock slumber as the gin began its day’s work. The whistle was used as a clock as it was blown at the beginning of the day and at noon and the end of the day. The cotton wagons furnished children an exciting and easy way of getting to town. They would hitch a ride on the wagons as they passed their homes on the way to the gin. 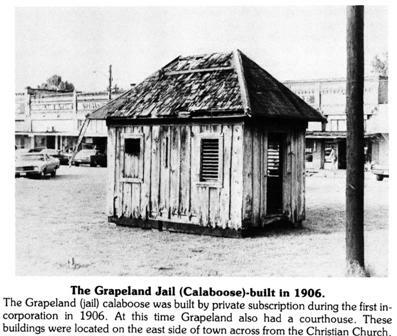 Dr. McCarty had the first local telephone system in Grapeland in about 1906. The switchboard was located in his home on Oak Street. Later another telephone system, the Grapeland Farm Telephone Co. began operating in Grapeland. Both of these systems were bought by J.S. Cook. Mrs. Edna Ellis and Mrs. Arie Newman served Grapeland for many years as telephone operators. Modern day service could never compare with that given by these ladies. The switchboard was located in the upstairs of Kennedy Bros. They could see all over town. Mrs. J.C. Shoultz recalls that once when a telephone call came from California to Mr. Jim at the school, theCalifornia operator was told by the Grapeland operator that Mr. Jim was not at the school. She had just seen him go in the drugstore and would connect the call up there. Where could you find better telephone service than this? They also watched for fires and other emergencies in the town. The first clay road was built in 1906 on Maple St. It was built by private subscription. Dr. McCarty owned the first car, Eugene Walling the second, and Geo. E. Darsey the third. Dr. Mc- Carty is said to have called ‘Whoa’ to his car when learning to drive it. These early day cars caused a great deal of confusion. People that owned these ‘dangerous machines’ would recklessly drive down the street at 8 miles an hour and endanger the lives of people in buggies and wagons! Gasoline for these cars was stored in an open field, because it was too dangerous a substance to keep in town. The fairs were an annual early day entertainment in Grapeland. Much time and effort was spent in preparation for them, they had parades, bands, food booths and areas set aside for the display and judging of such homemade articles as sewing, crocheting, canned goods & quilts. They also had judging booths for farm products such as corn, cotton, potatoes and dairy cows. On the morning of November 27, 1913 five thousand people gathered in Grapeland for a most unusual celebration–a ‘Possum Walk’. More than 150 possums marched down the main streets of Grapeland while the motion picture cameras of Path News took a movie of their progress. These same possums gave culinary delight the next day in the form of possum barbeque. This was a grand celebration with bands, a parade of floats and people from all over the state. Traveling shows also came to Grapeland at rather regular intervals. They would either have a show in a tent or rented building. They had medicine shows, circuses, sideshows, Wild West show, flying jennies, hobby horses, and exhibitions of music and dancing. But the citizens of Grapeland did not rely solely upon traveling shows for their cultural enrichment. As early as the building of our school in 1894, the citizens provided for a second story to be added to the building for use as a town hall and for community meetings and entertainment. Bird hunts, fox hunts and group picnics were also a common form of entertainment. A 1916 ad in the newspaper states ‘Tonight at the Electric Theatre, 4 reels of pictures; ‘Trick of Fate’, 2 reel drama; ‘Monkeyshines of Bootblacks’ 1 reel comedy; 1 educational reel all for 10 cents. Later the movie house was moved to the east side of town and was operated inside a building. It was owned by J.W. Howard. His wife ‘Miss Maude’ played the piano as the drama unfolded on the screen. She adapted the tempo of her music to the tempo of the plot. The story is told that as a newly wed couple entered the movie one night she burst forth with the opening of Wagner’s Bridal Chorus and accompanied their march down the aisle to their seats. On the night of March 4, 1913, fifteen business concerns including the Goodson Hotel in Grapeland burned. Men, Women and children worked through the night trying to control the fire and to salvage the merchandise in the stores. The total loss from this fire was estimated at $200,000 dollars and could have demoralized a town with less spirit, but most of the merchants of Grapeland immediately started to rebuild. Geo. E. Darsey who had been a merchant in Grapeland since 1886 was doing business the next morning across the street in railroad cars. Voluntary efforts on the part of the local citizens helped Mrs. Laura Goodson rebuild her hotel. 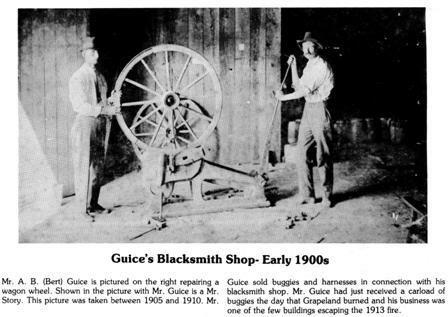 In 1915, a new industry appeared in Grapeland. Mr. A.B.Spence opened the Grapeland Bottling Works. They made all flavors of soda water—sour lemon, lemon, celery, vanilla, grape, pineapple, banana, strawberry, and orange. Clarence McCarty and Nesbit Lively worked in the bottling works for Mr. Spence. The business was located on the gin lot and later moved next door to the Woodman Hall. They delivered soda water to the stores in Grapeland and the surrounding rural communities. Business boomed one day when Clarence and Nesbitt got hold of some 100% alcohol and made a new drink they called ‘hop ale’. Early that morning, they sold W.R. Wherry, a local business which called itself ‘The Poor Man’s Store’ one case of ‘hop ale’. By the end of the day they had delivered 10 more cases to his store. This was good for business until Mr. Spence, the proprietor, discovered the ingredients of the drink. World War I came in 1917 and caused many changes in the lives of the people. Boys who had never been out of the county, had to learn how to ask directions in French. Many men from this area served in World War I and the people at home experienced many shortages because of the necessity of supplying our armed forces overseas. One amusing change was the switch from chewing tobacco to cigarettes. This change was stimulated by gas warfare. The men said you never let yourself get caught but once in a gas mask with chewing tobacco in your mouth. The war brought about a change in scope and broadened the outlook of people. ‘How You Gonna Keep Them down on the Farm after They’ve Seen Paree’ was one of the popular songs of that day that indicated the change in experiences. Mechanization that developed in World War I also led to many changes. Automobiles came within the reach of many people and travel became more common. In 1924, the need for Grapeland to again incorporate as a city became apparent. 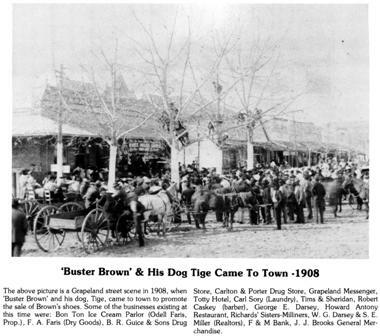 Livestock was still running loose in the streets; chicken coops were on the sidewalks of the stores in town and streets needed to be improved. An election was held April 11, 1924, and Grapeland officially became a city forth second time. A.H. Luker, editor of the newspaper since 1905, was elected its mayor. In the late 1920’s times were unsettled because of post war economic adjustments. In 1929 there was an economic collapse nationwide. Agricultural markets were very depressed, jobs were hard to come by and even college professors were riding the rails’ hunting any kind of work to get by. Hobos were a common sight for the next few years. The town of Grapeland being dependent upon the success or failure of the agricultural community around found its economy at a standstill. Governmental programs came into being to help the country make an economic recovery. Attempts were made to help the agricultural prices. Cattle and crops were bought by the government and destroyed to try to boost the market by eliminating an oversupply of goods. Many of us can remember the sight and odor of the cattle as they were piled on logs and burned. Many other agricultural experiments were tried for this same reason. Governmental work programs came into being to furnish wages for those who could not find jobs. WPA, (Work Progress Administration), was the best known program here and parks and public buildings were made possible through this program. At about its lowest point, the discovery of oil and gas in this area gave Grapeland a greatly needed boast. This development helped Grapeland recover from the depression and kept it from suffering as much as some areas. The first real industry developed with a new oil industrial process called recycling. ‘Wet’ gas was extracted from the ground and the liquid hydrocarbons were stripped from it and the dry gas pumped back into the ground to maintain field pressure. These plants in Grapeland were some of the first of their type and at one time several were in operation in the area. Many new families came to town. This was the first gas distillate field developed. Everyone remembers the ‘lights’ in the night sky from the recycling flares. 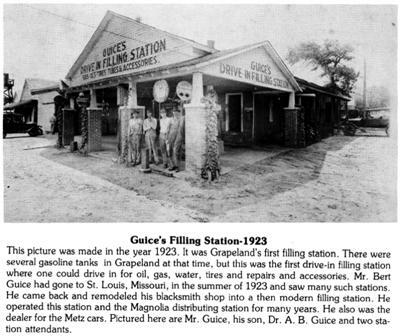 During the 20’s and 30’s electric public water works, sewage, the gas system, highways and city streets have helped Grapeland to become a well developed town. The Kraft Cheese Plant had opened here in 1937. It failed, but led to the development of a canning plant. The plant later burned in 1948, but both of them had furnished employment for the people and a market for agricultural products during this time. World War II came and the recycling plants became a war industry. Thousands of cars of aviation gas were shipped from Grapeland during this time. 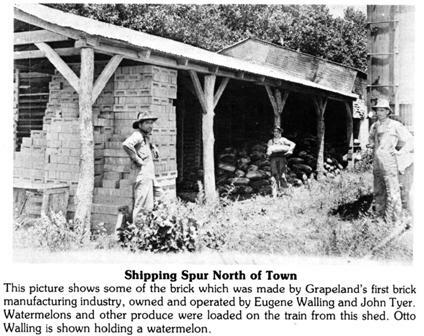 In 1944, 3,559 carloads of different products were shipped from Grapeland. After World War II, peanuts became King and the industry of the day was Alexander Mfg. Co. Big, fluffy petticoats made of nylon net were the fad of the day and Alexander’s produced them in abundance. They also made a very good line of children’s underwear. The annual fairs that were common in the early 1900’s again became popular and the First Peanut Festival was held in 1945. The parades for the early peanut festival were greatly enhanced with nylon net scraps from the petticoats made by Alexanders. Another milestone in Grapeland’s history was the building of a hospital. Within a period of two years the people of the Grapeland area had raised enough money to build a first class 10 bed hospitals. In 1966, this was enlarged to a 25 bed hospital. Each and every person in Grapeland and the surrounding communities contributed of their time and talents to make this dream possible. Dr. W.W. Brown was the first doctor to serve our hospital. He moved to California and our present doctor, E.G. Cutshaw has served the community and hospital for the last twenty-four years. Our history would not be complete without mentioning the other doctors who have served our community in the past. Many times this service was rendered in spite of the hardships involved. They traveled from river to river ministering to people in their homes. We have been fortunate in having doctors including our present ones who have been capable and willing to serve our needs regardless of personal inconvenience to them. Among those who have practiced here were Dr. Lewis Merriwether, Dr. F.C. Woodard, Dr. H.S. Robertson, Dr. P.N. Stafford, Dr. C.M. McCarty, Dr. Sam Kennedy, Dr. C.C. Hill, Dr. W.R. (Buss) Taylor, Dr. R.A. Farmer, Walter R. Jordan, George Beeler, Sr., and Paul Molina. Dr. Sam Kennedy stands out among these as having served this community for over fifty years. The Houston County Lake was built on the Little Elkhart Creek to provide more water for Houston County and to attract industry into this county. It has also become the site of many vacation homes and permanent residences. It is a source of recreation for the whole areas. In 1967, through the efforts of the Houston County Development Foundation, the Nuclor Corporation of America decided to move their steel joist plant to Grapeland. Since coming here this plant has greatly increased in size and now between 450 and 500 people are employed by Nucor. This plant has been a valuable asset to our community. In the last fifteen years, Grapeland has seen many changes. Three Federal Housing Developments have been built. A new ten acre park purchased for the public use. A 68 bed nursing home has been built for the elderly. Construction has been started on a Senior Citizen Center. The water system has been expanded; a new water tower built and a new sewage treatment plant have been constructed. 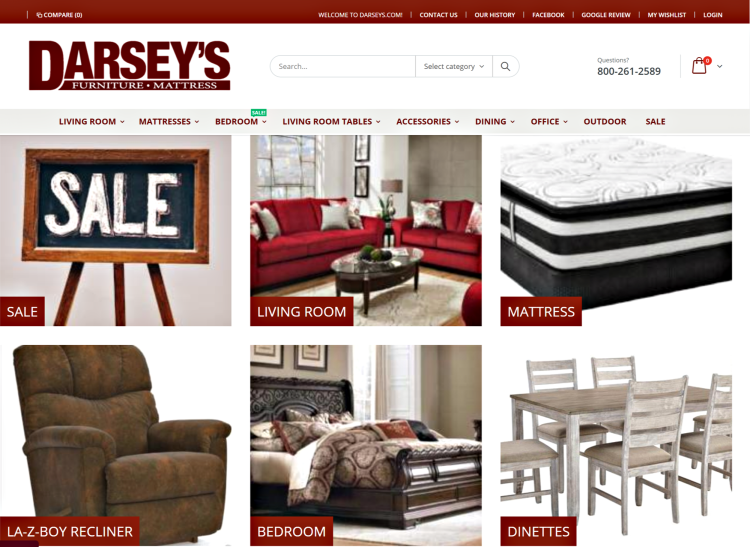 Some businesses have had a face lift, some look the same, some new ones have been added and others have changed. Our hospital has closed, but the building has been leased to be used as an alcohol and drug rehabilitation center. Grapeland has had many ups and downs during the past 100 years. What it is now, is the result of those who have gone before us. What it becomes will be the responsibility of us today. Today 2019 Grapeland Texas still a thriving community with new factories and businesses, Grapeland is still home. As we loose the people we love we gain so many new faces to our community. Lets keep Grapeland Texas GREAT!